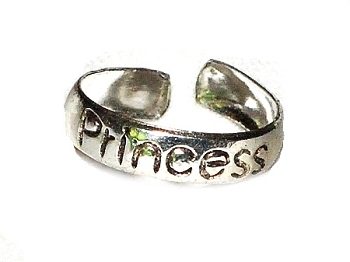 New Sterling Silver toe rings with Princess etched in. The rings weigh 0.8grams. All measurements are approximate.The rings are adjustable and have the 925 stamp. Sizes available are from Size 35to Size 9. PleaseSizes available are from Size 3 to Size 9. Please use options text for required sizes. Sizes available are from Size 6 to Size 9. PleaseSizes available are from Size 3 to Size 9. Please use options text for required sizes.